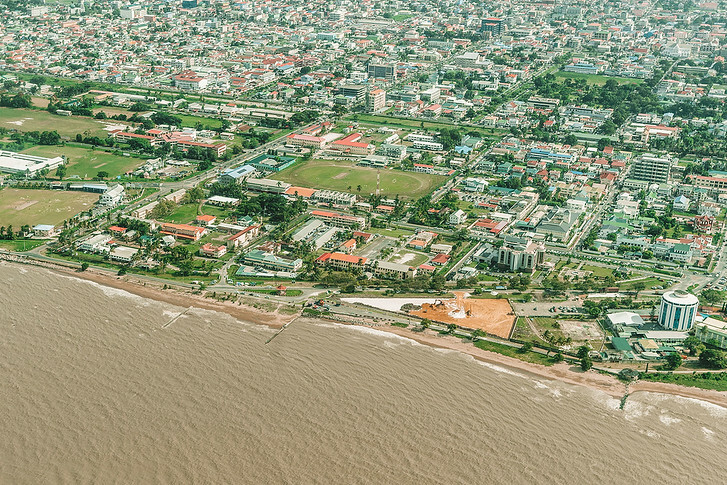 Georgetown, Guyana: The Best Things to See & Do in 2 Days! We flew into Guyana on an overnight flight from New York. My first clue that Guyana would be different than a typical South American country was our airline. We flew with Caribbean Airlines, the only carriers that offers nonstop service between New York and Georgetown. It turns out that Guyana’s colonial past and cultural makeup reflect the Caribbean more than the rest of South America. The small country has a very island vibe, with colorful pastel homes and swaying palm trees. It actually reminded us a lot of Grenada! We didn’t spend all that much time in Georgetown – our trip focus was on the country’s rugged Amazon interior – but enough to absorb the feel and taste of the capital. 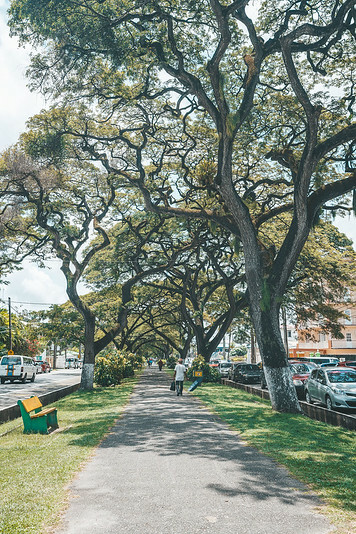 Here’s a quick travel guide for anyone looking to explore the highlights of Georgetown, Guyana! Georgetown has a tropical climate with hot humid days 365 days a year. The second we stepped off the plane we could feel the humidity! Like most other tropical destinations, there are 2 main seasons: rainy and dry. Rainy season runs from May to August and ideally should be avoided. Another great time to visit? Guyana has a number of vibrant festivals throughout the year, like Mashramani, Diwali and Holi, due to its multicultural population and unique history. Guyana has a couple 3-star hotels from both international chains and local boutiques. We particularly loved stayed in the heritage hotels that had beautiful colonial-era architecture. 1 | Duke Lodge – We stayed here on arrival. Duke is located in an antique colonial building right opposite the US Embassy in Georgetown (you’ll often find locals waiting in line for their travel visas). Duke Lodge is conveniently located within walking distance to most of the touristy buildings in Georgetown and suite rooms are roomy, with a small fridge and microwave to keep drinks cold! The best part? Fast wifi, free continental breakfast and a cooling swimming pool out back. 2 | Cara Lodge – After a week in the jungle, Cara Lodge felt like pure luxury. The hotel is housed in a gorgeous colonial style building with modern, comfortable rooms. Staff here are excellent and we had dinner here a couple times as the food is quite good! There’s a pretty inner courtyard where we hung out to grab drinks. 3 | Guyana Marriott Georgetown – We didn’t stay here but all the tour groups and business travelers stay at the Marriott as it’s a large property with hundreds of rooms. Over 90% of Guyanese live along the coast, mostly in and around the capital of Georgetown. Here you’ll find a blend of Caribbean and South American influences and a wonderful mixing pot of different cultures: African, European, Chinese, East Indian and Amerindian. From the colorful but dilapidated pastel buildings to vibrant street markets with food vendors hawking their wares, Georgetown combines a laid back feel with great energy. We took advantage of a driver and guide to show us the ropes, teach us about the city’s history and take us to the best markets. Most everything can be seen in 1 to 2 days, as there are just a handful of state museums and tourist sights from the colonial era. Here are some of the most popular things to do in Georgetown. You can’t visit the Caribbean without having some rum! Guyana is home to the brand El Dorado. 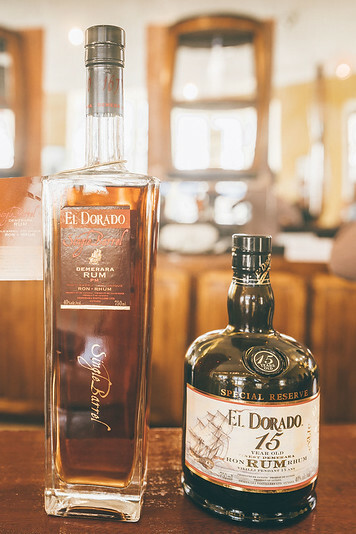 Although you may not have heard of it, local Guyanese are quite proud of how many international awards and ‘best rum’ lists El Dorado has won! 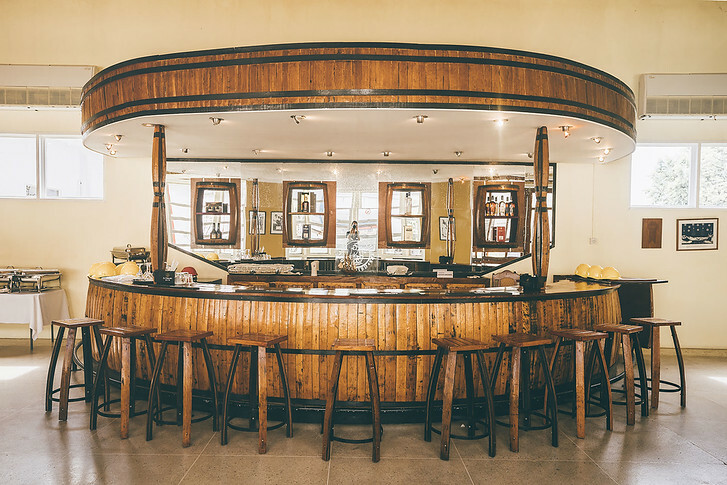 This home grown rum factory is located on the outskirts of Georgetown, and the secret to its magnificence lies in the sugar. Guyana boasts Demerara sugar, one of the finest sugar in the world. Large grained, crunchy and partially refined, Demerara has a natural caramel like flavor, and can impart caramel notes to whatever it’s added to. Our tour of the factory was short and sweet, just two rooms and a huge aging cellar. The real fun came with the tasting! We pulled up to the curved bar to try 3 different sipping rums. In the end, my favorite way to drink El Dorado was in a dark and stormy cocktail, mixed with lime juice that the locals always prepare fresh! A local restaurant called Backyard Cafe offers a really unique way to get to know Georgetown. 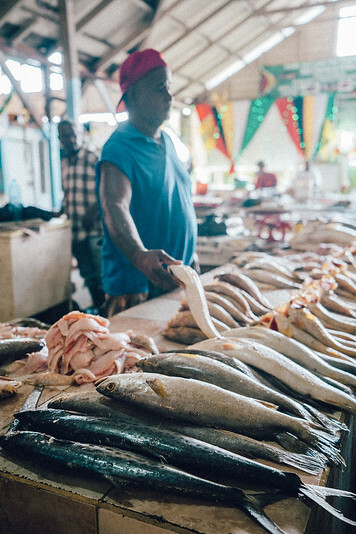 Call ahead, reserve a meal and Chef and owner Devan will lead you on a market tour of Bourda Market, one of the city’s largest fresh fruit, vegetable, fish and meat market. Discover some new fruits, pick your protein fresh and have some fun meeting the locals. Fruit is often sold on the back of trucks and fresh squeezed juices packed in little baggies out of car trunks. 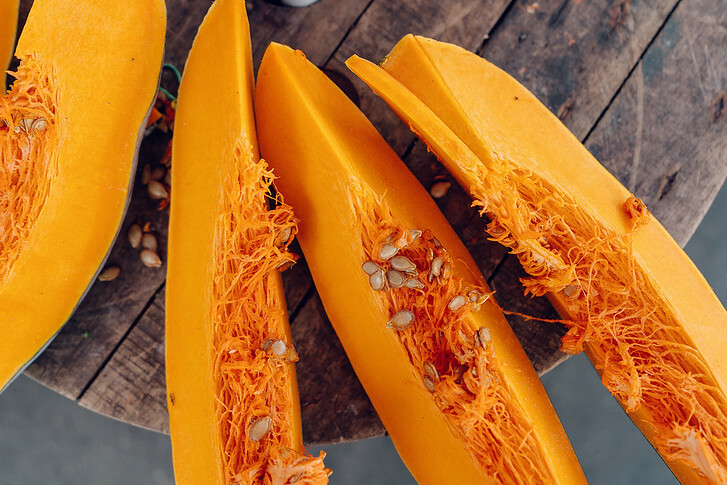 There are sections for fruits and veggies outside, then wet markets and butcher shops in a covered area, and even separate sections for rice, grains and sauces. It was fun seeing the local shopping first hand, and felt very similar to Asia. We were amazed at how large the local avocados are (they’re the size of pineapples!) and took a break from the heat with fresh coconut water. The best part was many vendors are kind to offer samples as you shop – we got to taste some of the most exotic and freshest fruit we’ve ever had – from jamun to noni to cassareep! 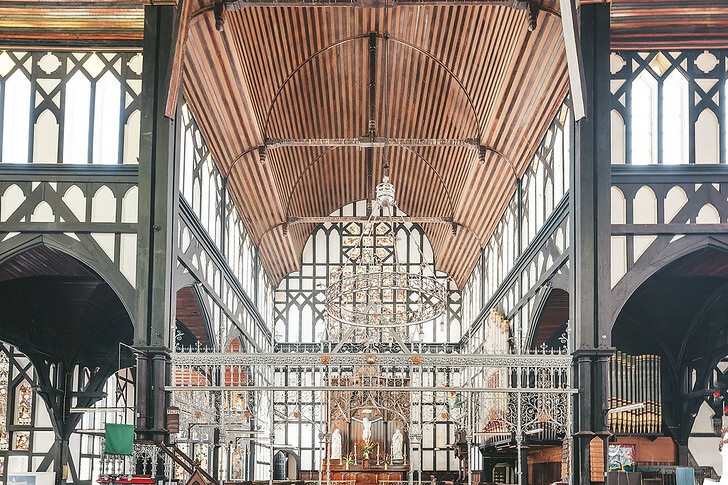 This large, white cathedral is said to be the tallest wooden structure in the world. 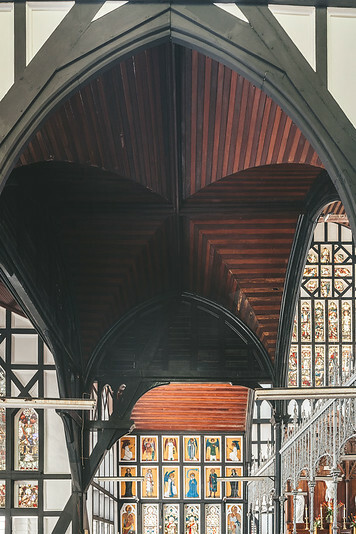 Completed in 1892 with pointed arches, vaulted ceilings and wonderful gothic architecture, St. George’s has a commanding presence in downtown Georgetown. While there’s not much to do but stop in for a quick look, St. George is an apt symbol for the country. All of the structural wood was built from greenheart trees, a native Guyanese hard wood that’s virtually fireproof and resistant to bugs. If you don’t have time to visit the interior, the Anthropology museum is the next best thing. 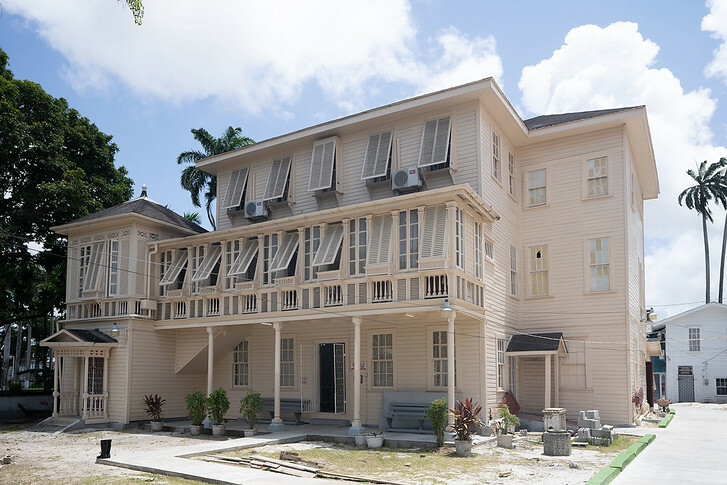 Inside are two full floors showing Guyana’s Amerindian heritage, with artifacts, old photographs and interesting exhibits. Note: Guyana’s museums have a bit of an odd photo rule: pictures are allowed but only if someone is in the frame posing. The national museum is a taxidermy takeover! Stuffed and preserved varieties of mammals, reptiles and birds native to Guyana are on exhibit. In fact, there’s even a room dedicated to the giant sloth, who was well over 15 feet tall and lived in the region during the Ice Age! 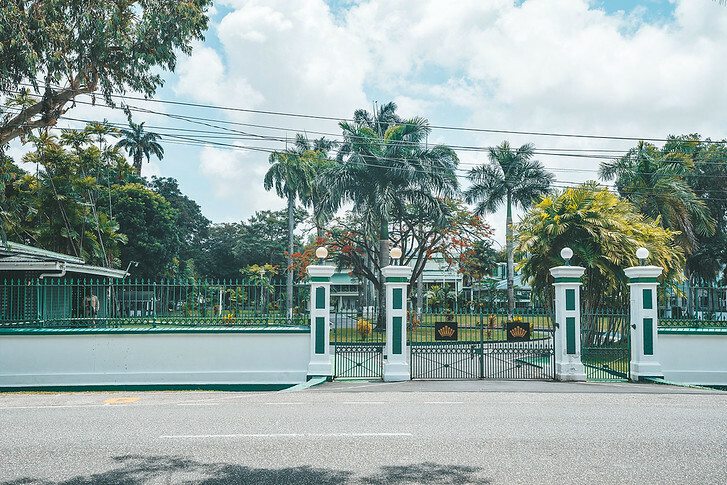 There are plenty of exhibits covering the history of Guyana – from the Amerindian culture to colonial expansion to post colonial Independence. Admission to the National Museum is free and a great way to quickly learn more about the country. 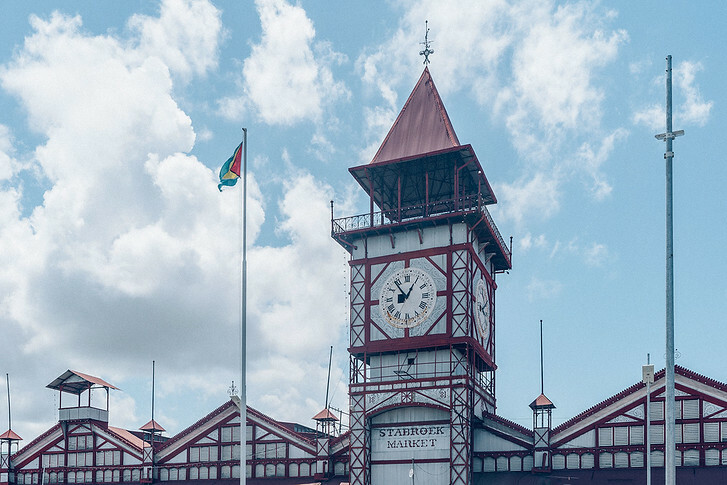 Stabroek is one of the most recognizable landmarks in the city due to its colorful cast iron facade and giant clock tower. The market is fast paced here and fun to visit just to snap a pic! It’s also a transportation hub as tons of mini vans / commuter buses pick up here. Make sure to stay alert in the area and don’t bring anything valuable. We were inside our van in the parking lot getting some drinks out of our cooler when a cheeky guy off the street came up to the car to get some water for himself! Botanical Garden: a great spot to bird watch and see the Victoria Lilies, huge water lilies that they say can hold up to 100 pounds! Have you ever been to Guyana? You get to go to so many cool places! Guyana is somewhere that I’ve only heard of before, but seeing these pictures is amazing. Now I want to visit Georgetown! Fantastic post with great information of a little know destination!